• Felt sole provides secure traction in slick wading conditions. • Rubber heel and toe rand provides increased durability and foot protection. fly fishing. [single, size 10] 1 lb 6 oz. The soles still have at least 60%- 70% of the original tread. - Item: G3 Guide Boots. - Color: Dark Elkhorn Brown. Simms wading boots, Felt bottom Size 11,green, gently used clean boots. Condition is Pre-owned. Shipped with USPS Priority Mail. Worn just a few times so great shape. All seems perfect, no tears, good laces, and felt is in perfect condition. Good clean boot! Simms Men's Freestone® StreamTread™ Felt Wading Boots in great preowned condition. The only flaw is that they have signs of wear. Despite a few dusty areas and crinkle lines in the shoe material. Condition is Pre-owned. Very lightly worn, felt sole wading boots. These vinyl and nylon boots are perfect for wearing in most average wading streams, they DO NOT have studs for wading on large rocks. 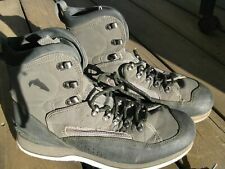 Simms Wading Boots Felt Bottom Mens Size 8 Fishing Excellent Used Condition. Condition is Pre-owned. Shipped with USPS Priority Mail. This is a Size 11 zip booty and is in good condition. The boots are in good shape with minimal wear, no cracking or weathering. Clean and ready to use. New ListingSimms G3 Guide wading boots, size 11, Vibram sole. Simms G3 Guide wading boots, size 11, Vibram sole.. Condition is Pre-owned. Shipped with USPS Priority Mail. 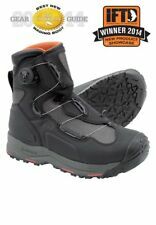 New ListingBrand New $160 Simms Freestone Felt Wading Boots Sz 11 - Nice! Re-engineered from the ground up, Simms' classic Freestone¨ Boot - in felt - features gold-standard stability and support at a price that won't break the bank. Classic style and bomber durability from the synthetic full-grain leather and scratch rubber upper. SIMMS Spiked Guide wading / fishing boots. Suede leather upper, mesh collar and studded felt outsole. Gently used, clean and in good condition. No cuts or tears. Please see all photos for more details. Size: US men's 12 We are happy to answer all questions to ensure a proper fit, but are unable to guaranty a proper fit. If your purchase does not fit, please notify us within 3 days of receipt and we will be happy to accept return. There was a mix up and the right boot has been used one time, there is a little wear and tear on that boot but it is minor and the left boot is brand new. Condition is New with box. WE ARE NOT ACCEPTING TRADES. Check out our profile for more information. These are new without box. These were floor models so do have slight soil on felt from being tried on. NEW, UNWORN, A LITTLE DUST ON BOTTOMS FROM STORAGE. Reengineered from the ground up, Simms' classic Freestone¨ Boot - in felt - features gold-standard stability and support at a price that won't break the bank. Source classic style and bomber durability from the synthetic full-grain leather and scratch rubber upper. Simms Vapor Boot Felt. Simms new comfortable Vapor Boot fishing wading boot allows you to be nibble and quick on the river Its lightweight, bulletproof felt sole design allows for stable traction on those snotty rock rivers. Simms Headwaters Felt Wading Boot. Rugged boot built to boldly excel on the approach and in the drink. The scratch rubber and high-denier nylon upper ensure long life. A partial neoprene lining adds appreciated cushioning and easy on/off performance. Color: Brown and Gray. Insole (Inside Length).10 3/4. you already own that fits you well, and compare it with the. Simms Freestone Wading Boots Men's US Size 10. Felt bottom, no studs. Used only a handful of times. In good shape. 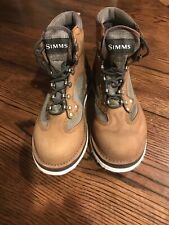 SIMMS Wading / Fishing Boots Shoes. All man-made materials, felt outsole. Used and in good condition, no cuts or tears. Please see all photos for more details. Size: Men's 11 Measurement: Inside - 11 3/4 inches We are happy to answer all questions to ensure a proper fit, but are unable to guaranty a proper fit. If your purchase does not fit, please notify us within 3 days of receipt and we will be happy to accept return. But Montana's version is the gold standard, cutting through the Sapphire and Garnet mountains and crawling with thick trout and ultra-slick wading opportunities. Simms' Rock Creek Boot, with a full-length retention plate for HardBite™ studs, is the solution to stomping out the slip factor. Color: Dark Elkhorn. For those occupying the latter category, Simms’ G3 Guides™ raise the bar with a RiverTread™ platform bolstered by proprioception, which minimizes rigid underfoot materials in order to enhance feel whether on the trail or in the water. Simms Wading Boots Size 7 Model 27740-00. Beige lace up ankle boots with vibram soles. Simms Freestone Wading Boots Brown Leather Fly Fishing Felt Sole Men's Size 10. Condition is Pre-owned. Shipped with USPS Priority Mail. The Boa¨ closure system provides precise, on-demand fit, enveloping partially lined neoprene internals that bolster warmth, cushioning, and easy-on/off capabilities. SIMMS WADING. Waterproof synthetic leather, TPU & scratch rubber upper with a Boa¨ closure system for a precision, on-demand fit. Our G3 Guide™ Wading Boot is designed with working guides in mind. Condition is New with box. WE ARE NOT ACCEPTING TRADES. SIMMS MAN BOOTS WADING FISHING TAUPE LEATHER SIZE US 11. No shoe tree or display is included. Style: wading, fishing, anti-slip, hiking, fly-fishing, angling;. -A boot that features an engineered balance of value & wading performance;. -Source classic style and bomber durability from the synthetic full-grain leather and scratch rubber upper;. SIMMS Wading / Fishing Boots Shoes. Man-made material upper with felt outsole. Used and in good condition, no cuts or tears. Please see all photos for more details. Size: Men's 10 Measurement: Inside - 11 inches We are happy to answer all questions to ensure a proper fit, but are unable to guaranty a proper fit. If your purchase does not fit, please notify us within 3 days of receipt and we will be happy to accept return. SIMMS heel pull tab. Overall excellent condition. 3rd speed hook from the top is missing on the right outer side boot as seen in the picture. VIBRAM rubber sole treads are in mint condition with minimal wear. This is a Size 7 zip booty and is in good condition with 1 repair spot caused by a sting ray.